At the heart of the Great British Chicken message is a passion for the importance of buying British chicken as it assures the consumer of a certain standard whilst supporting UK produce. Its remit is to educate British consumers about the benefits of buying British chicken and how to identify it as such by looking for the Red Tractor and Union Jack on packs oc chicken or by asking their butcher. Great British Chicken wants people to be able to make an informed choice about the chicken they buy. Chicken is the UK's favourite meat - it accounts for 43% of all the meat we eat in this country. This should come as no surprise: not only is chicken tasty, versatile and easy to prepare but it is also higher in protein and lower in fat than red meat, making it a nutritious, healthy choice that will tempt the whole family's tastebuds. Sporting legend Sally Gunnell, who still holds the 400m hurdles world record, is a big fan of British chicken. As an athlete, it was essential to eat lots of fresh, good quality, nutritious foods and chicken was one of my staple ingredients. Not only is it lower in fat than red meat, its also higher in protein  which gives you energy. As a parent, and the daughter of a poultry farmer, Sally is passionate about knowing where her meat comes from, and supports local producers wherever possible. We eat chicken at least three times a week, and only British will do. I ask my butcher, or if I'm in the supermarket I always look for the Red Tractor and Union Jack. That way I know the chicken was produced to high standards and can be traced back to the British farm it cam from." Choose chicken with the Red Tractor and Union Jack on pack and you'll know it was produced to high standards and can be traced back to the independently-checked British farm it came from. Or ask your butcher if it's British. Quick and easy to prepare, this recipe is perfect for barbecues and al fresco dining. 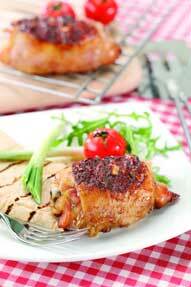 The tangy sauce can also be used with drumsticks or cubes of chicken speared on kebab sticks. Place the chicken thighs in a dish. Combine the soy sauce, sugar, sherry, ginger and garlic, pour over the chicken and mix together. Cover and chill overnight. Put the thighs and sauce into a single layer in a roasting tin. Bake in the oven for 40 - 45 minutes, turning halfway through. If barbecuing the thighs, cook over medium hot coals for 35 - 40 minutes, turning regularly. Serve with roasted tomatoes and warmed tortilla wraps. When BBQing, always make sure the chicken is cooked thoroughly before eating. To check this, pierce the plumpest part of the flesh and make sure the juices run clear. If not, cook further.